As per our research, leaking air ducts can cost you more or less half of your energy bills? That means that for every dollar you pay energy companies, you haven’t actually enjoyed the comfort that your bill shows otherwise. Thus, duct sealing and duct repairs are necessary measures that should not only ensure your comfort, but it should also help you save as much as half of what you are currently spending on your electric bills. 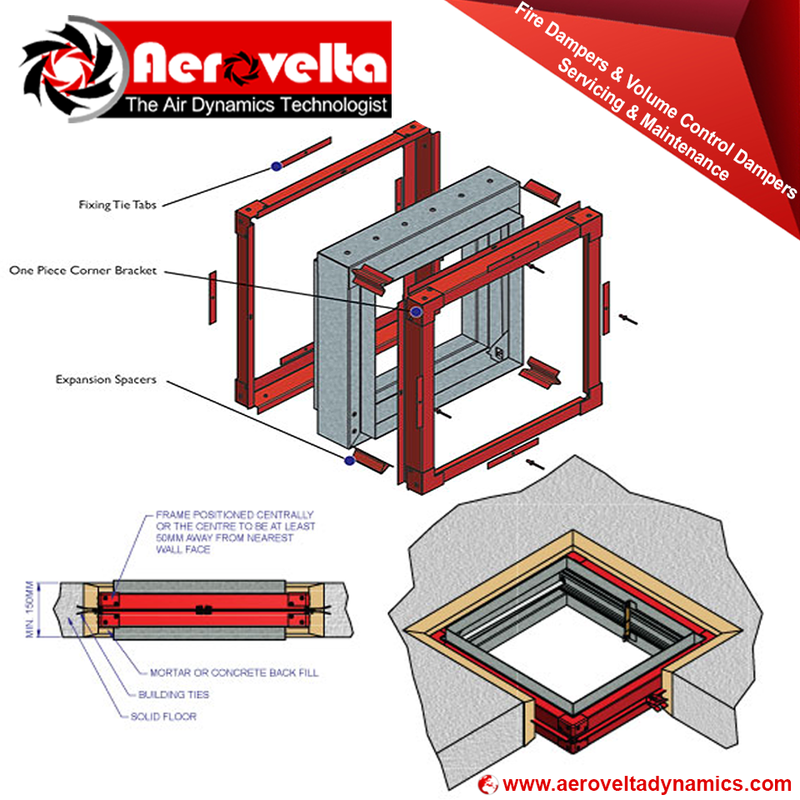 For whatever your problems with your duct systems are better call Aerovelta Dynamics right away! You might have been spending lots and lots of hard-earned money in energy bills for consumption that you have not enjoyed. Maximize your energy efficiency while making sure your precious conditioned air is not being used in places that don’t need it! 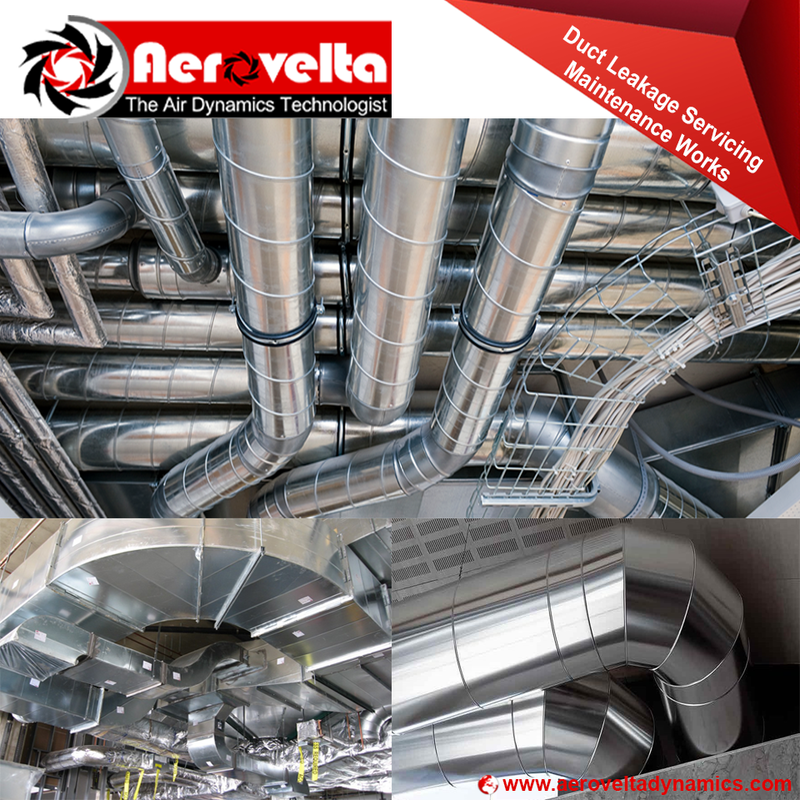 Call Aerovelta Dynamics now and take advantage of the topnotch quality duct sealing and duct repairs that no other company can offer. Trust only in All Year and your ducts would be working great all year long – and even longer! Water leaks and broken pipes can be a big problem for any Industrial sector. Because water in supply pipes is under pressure (normally about 50 pounds per square inch), if a pipe or fitting springs a leak, the water usually sprays out with considerable force. Because of this pressure, it’s usually pretty obvious if a pipe is leaking—even if the pipe is inside a wall or above a ceiling. 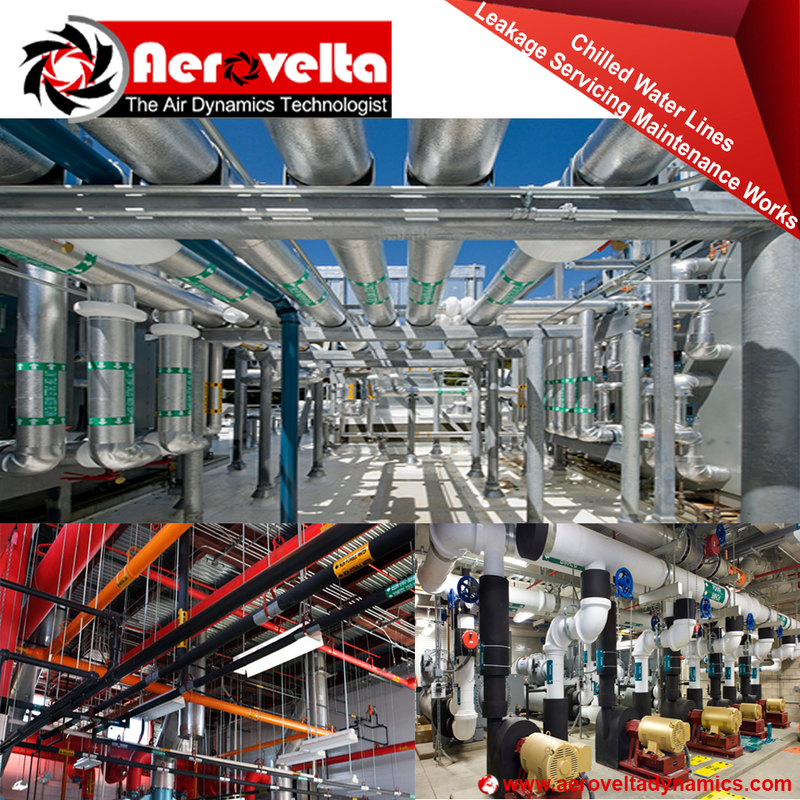 Aerovelta have experienced team of plumbing technicians for your chilled water pipes leakage problem. All ductwork should be fitted with Volume control dampers & fire dampers that have been tested upon installation. Fire dampers play a crucial role in buildings’ fire safety systems, which is why it is important that they operate correctly. The difference between a well maintained fire damper and a poorly maintained fire damper could be the difference between life and death if there is a fire in your building. With this in mind, it is important to make sure that your fire dampers are inspected, tested and maintained after every 3-4 months Aerovelta technicians have expertise to maintain these air devices & have experienced to troubleshoot the problems which we look in these fusible links of fire dampers. 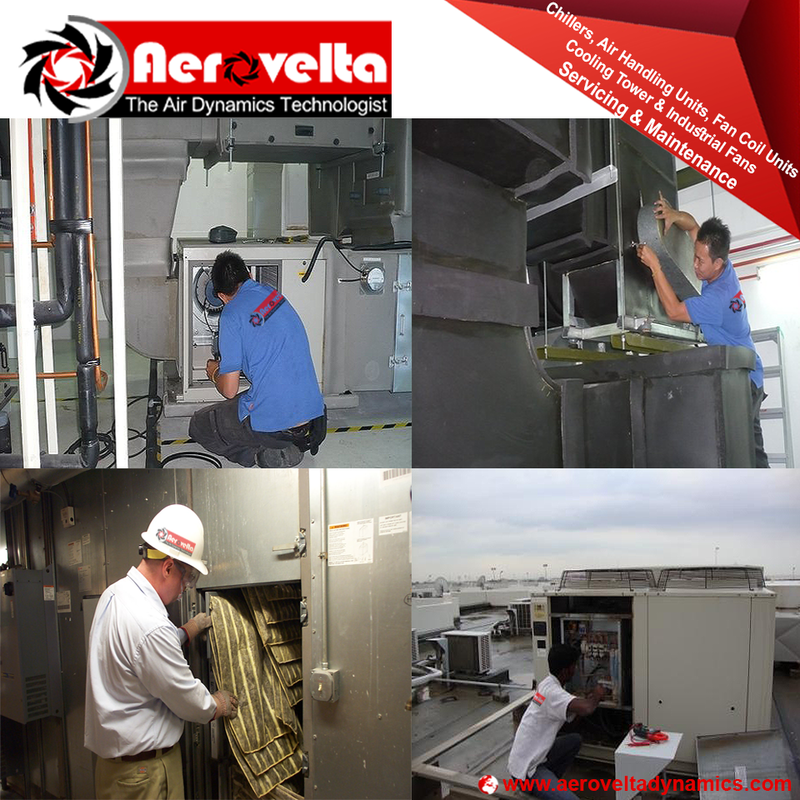 Aerovelta offers a wide range of Maintenance facilities for the clients includes all types of Chillers, Cooling Towers, Air Handling Units, Heavy Duty Industrial & Exhaust Fans and all types of Industrial ventilation & cooling equipment’s.